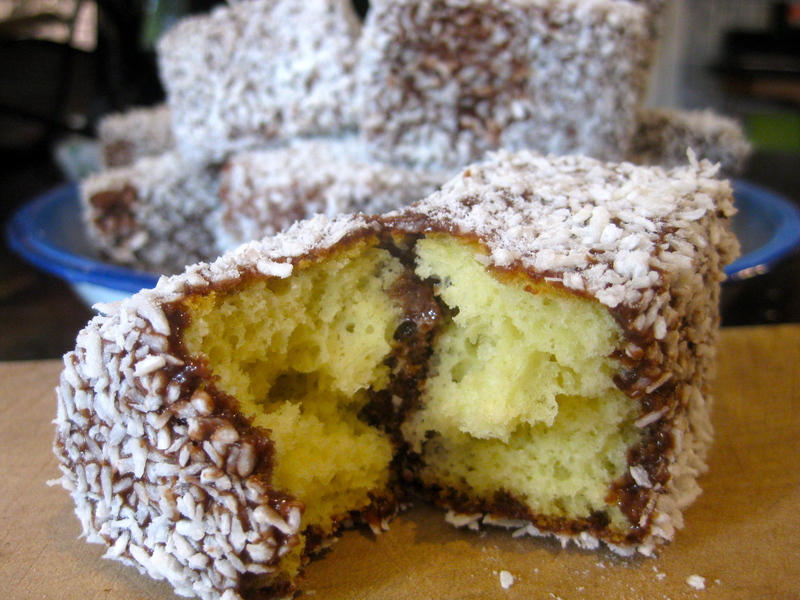 This is what a lamington looks like. It’s pieces of sponge cake that have been dipped in a thick chocolate glaze and then covered with desiccated coconut. They’re very popular in Australia. Popular enough that you can buy them pre-made in little packets at every supermarket. I haven’t had eaten one for over four years now, since we left Sydney. Recently my 10yr old son has shown an interest in baking and so I thought lamingtons would make a nice easy project. I bought a packet mix sponge cake and a whole lot of icing sugar and once I let go of the idea of maintaining control, and accepted the mess, I was fine. This is a fun and easy project to make with kids but please don’t underestimate the amount of mess that can and probably will happen not only from the mushroom clouds of icing sugar and spilt coconut but from the thick, glossy and glorious chocolate glaze that will get flicked and dipped from here to kingdom come. I recommend developing a system. Mine involved me dipping and rolling a couple of surfaces – and letting KT cover the rest of the sponge in coconut. He felt this was enough involvement and so did I. Some tips before you begin – instead of baking the sponge in a round cake tin or two ‘sandwich’ tins, use a rectangular slice tray. Bake it the day before to let the cake go a little bit stale. This makes for easier, less crumby work. I’d recommend the Sainsbury’s brand Victoria Sponge Kit, not because they’re paying me to say this, but because I’m lazy and out of the two varieties of cake mix I tried, it held up well and got the right amount of height. The next day cut the sponge slab into cubes or pieces that you feel are the right size for you. You could make giant ones or teeny-tiny ones. Then make up the glaze and set up your work station into three sections; sponge cubes, a bowl full of chocolate glaze and a bowl of desiccated coconut. The key to success is to let the glaze drain well. If you dip over-wet cake into the coconut, things are going to get very messy and you’ll waste a lot of coconut. Once you’ve finished, be sure to keep the lamingtons in a sealed container so they get softer and oozier as the days go by instead of drying out. Day-old sponge cut into about 16-20 pieces. Put icing sugar, cocoa, butter and milk into a heat-proof glass bowl and stir over a pan of simmering water. Stir with a whisk until the mixture becomes thick and glossy. If you think it needs it – loosen the glaze with a bit more milk. Dip the cake pieces into the warm glaze, drain, and then tumble into the coconut. 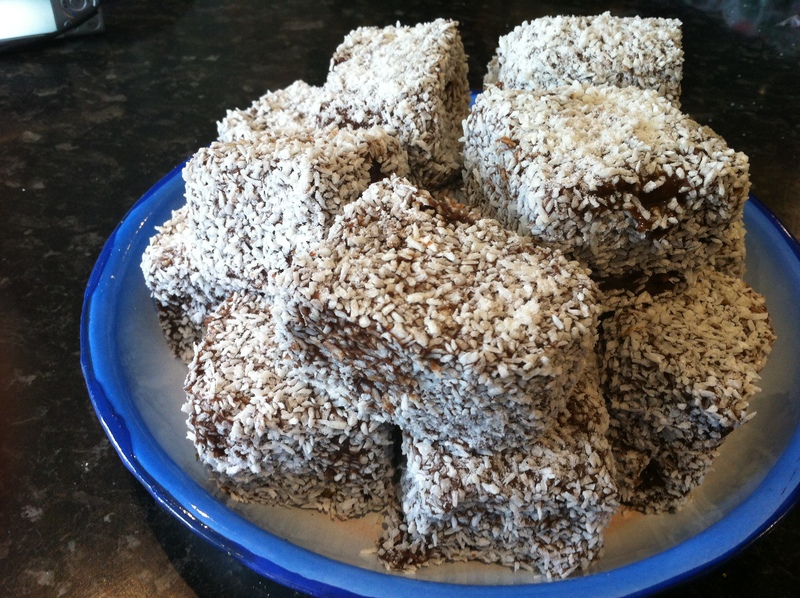 Stack your lamingtons high and watch your friends and family go crazy over this treat from down under.